The record is made up of 1 volume (295 folios). It was created in 19 Apr 1923-6 Nov 1924. It was written in English and Arabic. The original is part of the British Library: India Office The department of the British Government to which the Government of India reported between 1858 and 1947. The successor to the Court of Directors. Records and Private Papers. 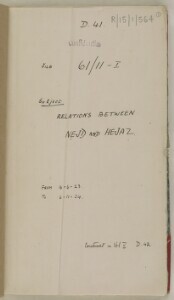 The volume consists of letters, telegrams, and memoranda relating to relations between Najd and the Hejaz. The majority of the correspondence is between Reader Bullard, the British Agent in Jeddah, the Political Residency A diplomatic office of the British Government established in the provinces and regions considered part of, or under the influence of, British India. in Bushire, the Political Agency An office of the British Government and, earlier, of the East India Company. in Bahrain, the Political Agency An office of the British Government and, earlier, of the East India Company. in Kuwait, the High Commissioner in Baghdad, the Colonial and Foreign Offices, both in London, the High Commissioner in Jerusalem, the Government of India, and Ibn Sa'ud himself, or his representatives. Most of the volume covers events leading up to, and immediately after, the Ikhwan's capture of Taif, including Hussein ibn 'Ali's abdication and his son 'Ali's attempts to retain control of the Hejaz. There is a detailed report of the capture of Taif by Bullard (folios 186-201, 273-281). The documents reflect British concern with the reaction of Indian Muslims, with duplicates of correspondence regularly forwarded to numerous offices back in India. Some papers are about the effort to evacuate British Indian refugees and pilgrims from the region. the motivations and movements of St John Philby and Rosita Forbes, both of whom were thought to be trying to gain entryinto Central Arabia. 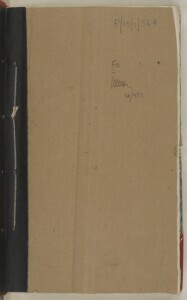 Notable in the volume are a newspaper cutting from The Times of Mesopotamia , dated 13 July 1923, regarding treaty negotiations between Britain and King Hussein (folio 4), and extracts of letters from Ameen Rihani to Ibn Sa'ud that had been intercepted by the British and which offer advice on foreign policy. The volume is arranged chronologically. The internal office notes at the back of the volume (renumbered as folios 247-258) include a chronological list of the main contents, together with a simple, running index number from 1 to 111. These index numbers are also written on the front of the documents they refer to, in red or blue crayon and encircled, to help identify and locate them within the volume. 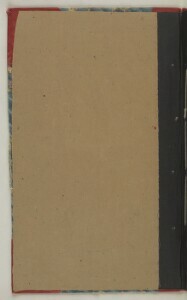 Main foliation sequence: numbers are written in pencil and circled, in the top right corner on the recto The front of a sheet of paper or leaf, often abbreviated to 'r'. of each folio. 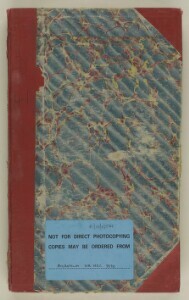 The numbering, which starts on the front cover of the volume and ends on the inside back cover, is as follows: 1A-1D, 2-262. Secondary and earlier foliation sequence: the numbers 1 to 322 are written in pencil in the top right corner on the recto The front of a sheet of paper or leaf, often abbreviated to 'r'. 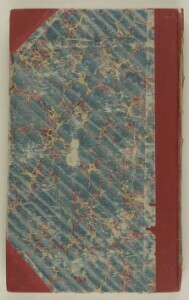 of each folio, except for the internal office notes at the back of the volume, which are paginated in pencil from 1 to 23. 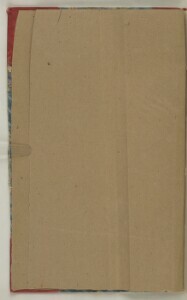 Published copies of four British Government reports at the front of the volume (renumbered as folios 2-63) also have pencilled page numbers written on them.